Paintings that might make you go Hmm! After I made “Ganesh waves at passing universe“, I started to finish out the series with Vishnu. As I started painting, it became very obvious that this was more about Seshnag the serpent. If you see the traditional paintings of Vishnu, you will see him perched uncomfortably on top of the well-organized coils of Sheshnag. However, Seshnag should adapt his coils around Vishnu to make Him most comfortable. As I started building the coils, I realized that they must be random orientations similar to string theory talks about the random strings that make our universe. One of my Russian friends reminded me that Sheshnag is inside the universe as well outside it. This really excited me because it completely confirms my thoughts! My friend introduced me to the mathematical concept of the multi-dimensional Klien Bottle. Klien bottle for the uninitiated is like a Mobius Strip in 4 dimensions. 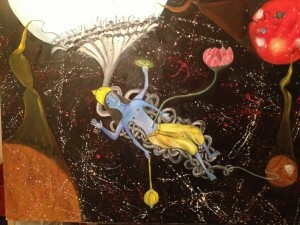 I had to redo part of the painting to depict the serpent supporting the universe, and also originating from within it. I am so in love with this concept that I am doing a multi-dimensional version of the same painting. 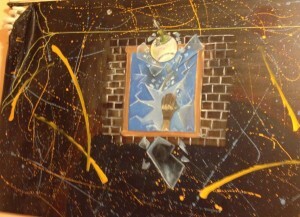 This entry was posted in Art Expo 2013 on March 12, 2013 by Administrator. There was a competition between all the devis and devtas to see who could traverse the entire universe the fastest. While each of the gods tried to race in their own modes of transportation, Ganesh put his parents in the middle and started to go around them while seated on his mouse ride. 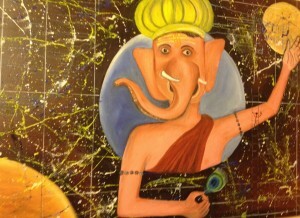 As Ganesh circled his parents, all other gods and goddesses could see Ganesh way ahead of them. As I began to understand relativity, I figured out that as you approach the speed of light, the dimensions will shrink to the extent that the universe will be a mere dot. This sounds pretty similar to what our friends at the giant atomic collider in Cern, Switzerland try to do. The Cern folks are constantly sending particles around in circles until they approach the speed of light – and then WHAM, the God Particle! 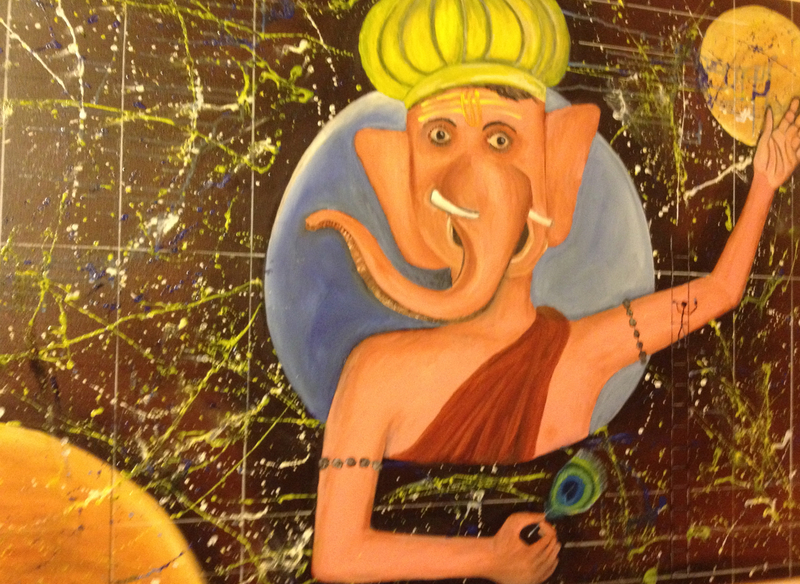 Some points about the painting: I painted Ganesh from first principles and ignored how he is traditionally painted. I painted Him as I imagined Him when I was a child (though putting on a blue checkered shirt would have been too much). I questioned the idea that He is fat. No Indian in history or mythology was fat, so why should Ganesh be? Ganesh was an ordinary kid until his head was replaced by an elephant’s head. I used the same logic for not putting any jewelry on Him. Looking at the simple life his parents led, in my opinion, Ganesh would not opt for gold and bling! What is indoors and what is really outdoors? The answer is “it depends.” If we look at outdoors as something out of our homes, then what about from the perspective of the world, or the solar system, or the galaxy and possibly the universe? This is also a comment on our quest to go out and discover the unknown. It pokes a little fun at those trying to discover the “God Particle.” We have no idea what we are trying to unravel; like the hand that is ripping the canvas from which it exists. 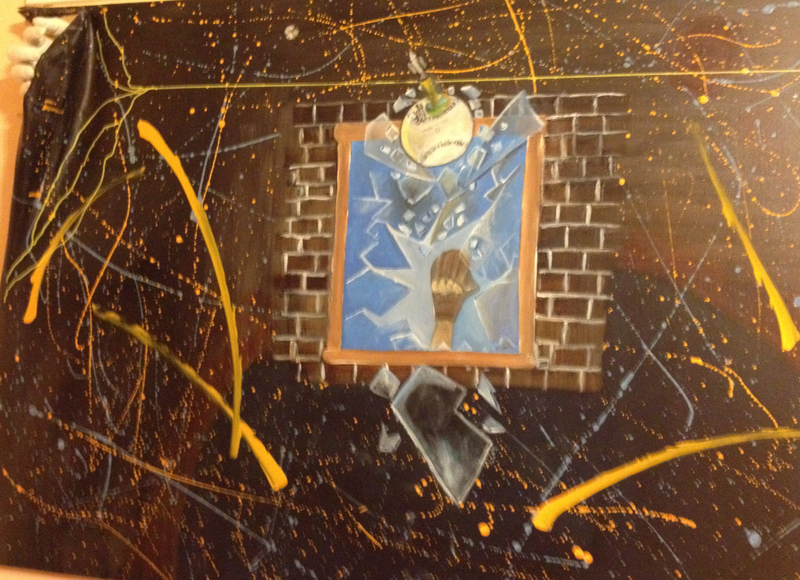 This entry was posted in Art Expo 2013 on March 10, 2013 by Administrator. 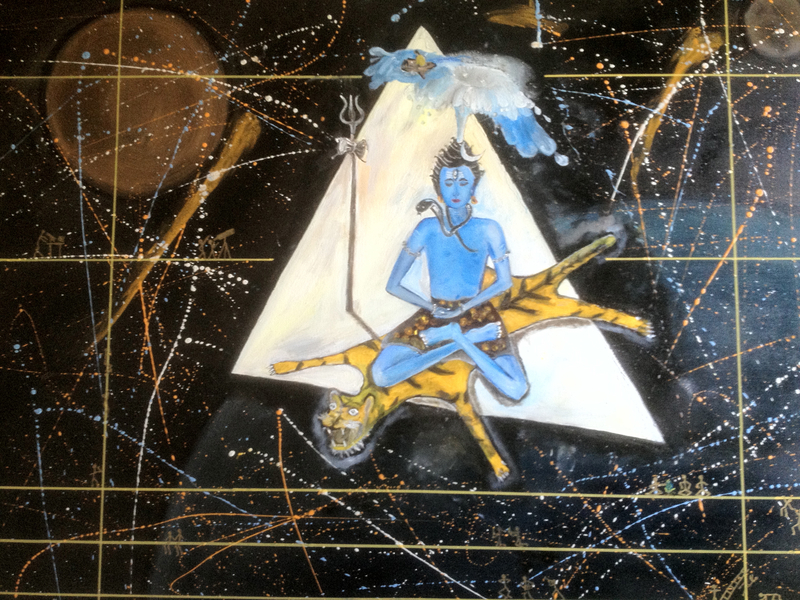 Getting ready for New York Art Expo 2013 – Siva! The NY Art Expo is just weeks away and I am very excited to show my latest works! Last year, I met the noted surrealist critic Nickolay Botov. He really liked my “Outdoors” and “Still Life With Vase” and suggested that I continue in the indoors-outdoors theme. I was really fascinated by the idea and I added more paintings in this style. The first one was “Siva!”. 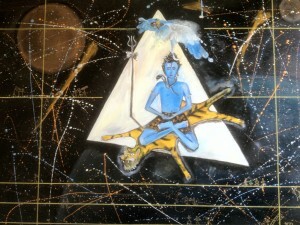 Through “Siva!”, I discovered the connection between surrealism and Indian mythology. I became more obsessed with the tiger skin looking like a real tiger ready to pounce. Now I understand Dali’s obsession with religious themes! Of course, I added my own symbols into the painting. Why the triangle (does it remind you of a glacier), why shadows in reverse direction, why the layers? We might never know! Of course, I created my own symbols into the painting. Why the triangle (does it remind you of a glacier), why shadows in reverse direction, why the layers… We might never know! This entry was posted in Art Expo 2013 on March 9, 2013 by Administrator. Welcome to my latest website, I hope you like it. Please feel free to browse around. I paint because I have to. I have this compulsion to give my unsolicited opinion about everything. Usually, I have something funny to say, but when you think a little deeper, you will find that there is a grain of truth in what I am saying. That is because I am most serious when I am joking! I still have links to my old website. I loved the old site because the site was an experiment in art and technology for me. As you look at my earlier paintings, you will see a little bit of clunkiness in the works. I felt that the old website reflected that rawness. It was a lot of fun! My paintings are evolving once again and I feel that the new works need a little more elegance. Hence this new site. The new site allows you to post your comments and possibly influence my works. Have fun, enjoy! This entry was posted in Uncategorized on March 9, 2013 by Administrator.